* EL PLAZO DE PRESENTACIÓN SE ABRE EL 1 DE FEBRERO Y SE CIERRA EL 15 DE FEBRERO DE 2019. - SERVICIO DE ATENCIÓN CIUDADANA (SAC) DEL AYUNTAMIENTO: LUNES DE 9:00 A 14:00 HORAS. DE MARTES A VIERNES DE 8:00 A 14:00 HORAS; MARTES Y JUEVES DE 16:30 A 18:30 HORAS. 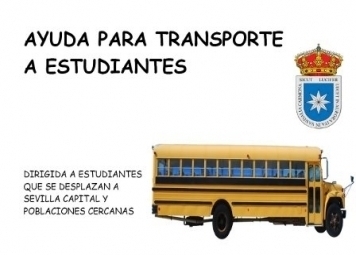 * TAMBIÉN SE PUEDE PRESENTAR LA SOLICITUD DE LA AYUDA AL TRANSPORTE DE FORMA TELEMÁTICA, A TRAVÉS DE LA SEDE ELECTRÓNICA DEL AYUNTAMIENTO DE CARMONA, UTILIZANDO EL MODELO DE INSTANCIA GENERAL, ADJUNTANDO LA SOLICITUD Y LA DOCUMENTACIÓN NECESARIA. * SE ADJUNTA MODELO DE SOLICITUD (PDF). * SE ADJUNTA MODELO DE SOLICITUD DE APERTURA/MODIFICACIÓN DE FICHA DE TERCERO Y PAGO POR TRANSFERENCIA (PDF). LAS PERSONAS QUE HAYAN ENTREGADO ANTERIORMENTE LA FICHA DE TERCERO NO TIENEN QUE VOLVER A ENTREGARLA. * SE ADJUNTA MODELO DE DECLARACIÓN RESPONSABLE DE INGRESOS (PDF). * TAMBIÉN SE ADJUNTA MODELO DE DECLARACIÓN RESPONSABLE DE AUSENCIA DE PROHIBICIONES (PDF).